The open dialog is shown. As an alternative to the open dialog, you can also open files using drag-and-drop from the Windows Explorer©. For dropping, use the area outside the tree view. 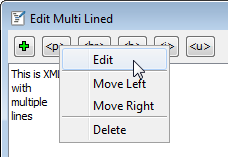 To do this, click a file in the Windows Explorer, hold the mouse button and drag it into the Easy XML Editor window. When dropped there, the file/files is/are opened. 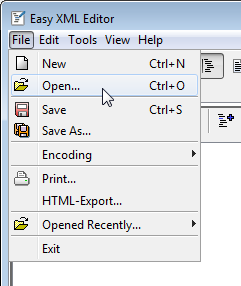 The menu item File->Opened recently provides access to the files recently opened in the application. Selecting an item in the list will re-open this file. 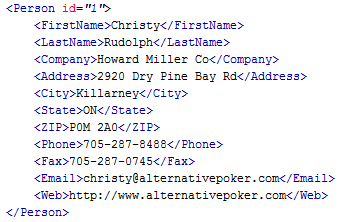 There are several ways to change name and text content of elements. 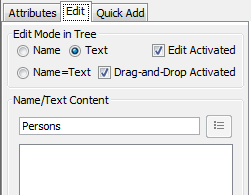 You can use the text fields above the tree, the tab 'Edit' (right) or edit directly in the tree. Modifications are shown immediately. 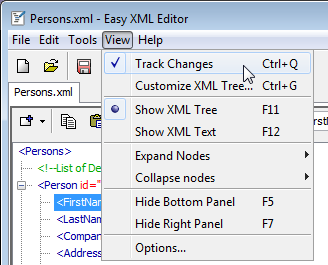 By clicking on an selected node, it is edited as configured in the edit mode of the tree. As default the mode is 'Text'. That means the text content is changed. 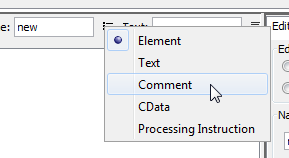 Here you can also specify whether editing is allowed in general and whether drag-and-drop is activated. If the node has a long text as content, it can be helpful to wrap the text in the field. 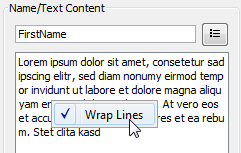 Do do so, right click on the field and choose 'Wrap lines'. An example follows. 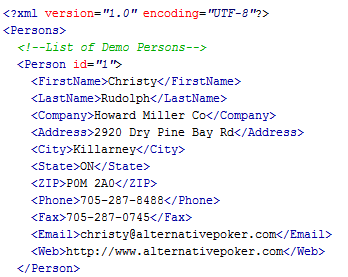 The list entry does not have to start with the text entered. 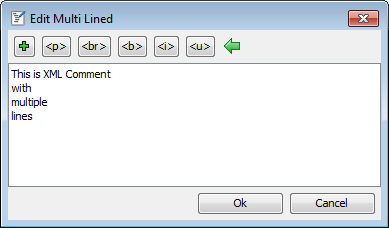 The window "Edit Multi Lined" is opened. Here you can easier edit longer text. If a node text content has a line break, it can only be edited using this feature. 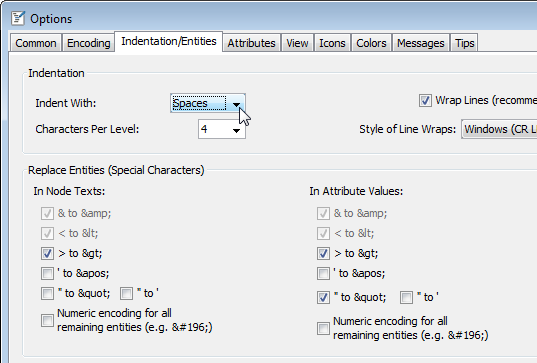 The dialog window offers the usage of text templates. By clicking on one of the buttons or by pressing the key shortcut, the text defined is inserted. 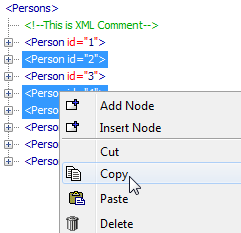 For editing attributes please select the corresponding node. 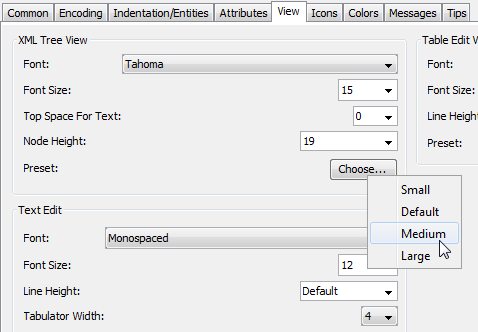 In the tab "Attributes" you can add, delete and edit attributes. 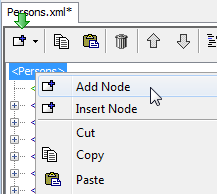 To add a node, select one or more (parent) nodes and choose "Add Node" from the context menu (right click into tree) or use the "Add Node" icon. This will add a child node to every node selected. 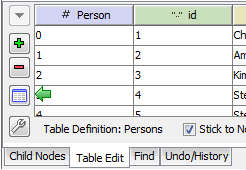 Another way to add nodes is described in the next section. 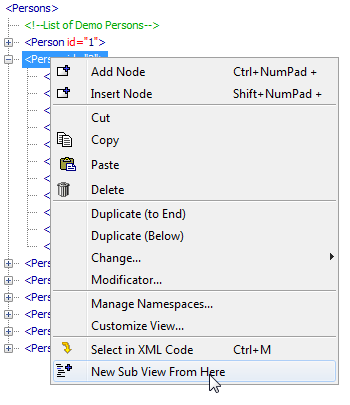 In the window please enter the names and text contents of the new nodes/attributes. With "OK" the new items are added to the selected nodes. 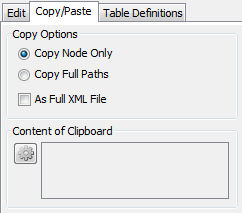 You can copy a selection of nodes to the clipboard. This will copy the selected nodes to the clipboard. The result may look like this<. 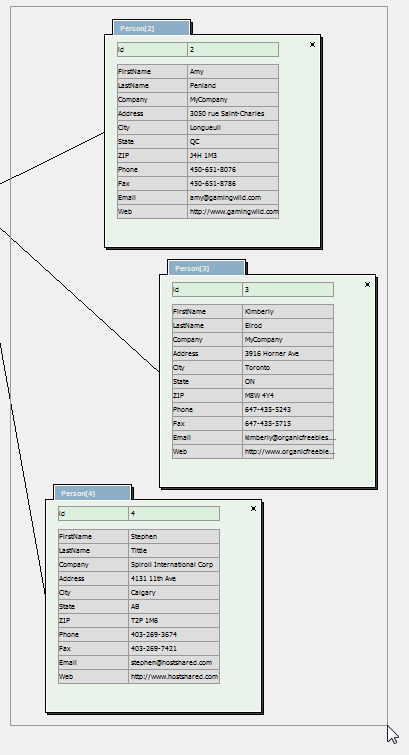 and, if necessary, a root element is added that encloses the nodes selected. 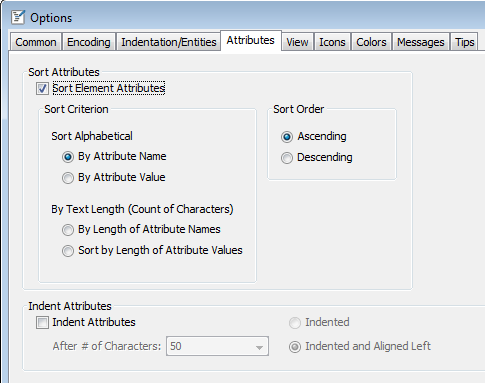 You can paste attributes, too. 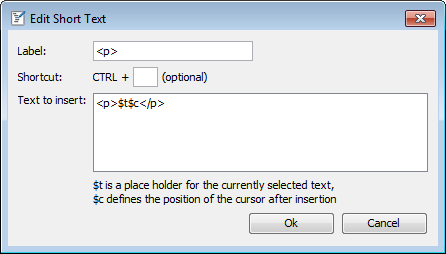 For this, the clipboard must contain text in the format [name]="[text]", multiple lines are possible. An example follows. Using this text you will add the attribute "id" und "type" with the contents "007" and "archived". 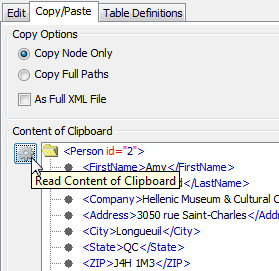 In the tab 'Copy/Paste' a preview of the clipboard XML data is available. By clicking on the refresh button, the content of the clipboard is re-read. You can delete one or multiple nodes with one operation. 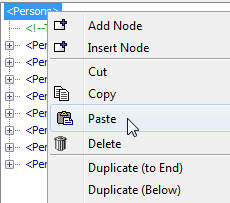 To do this, select the node(s) and select the delete function from the context menu or using the icon. 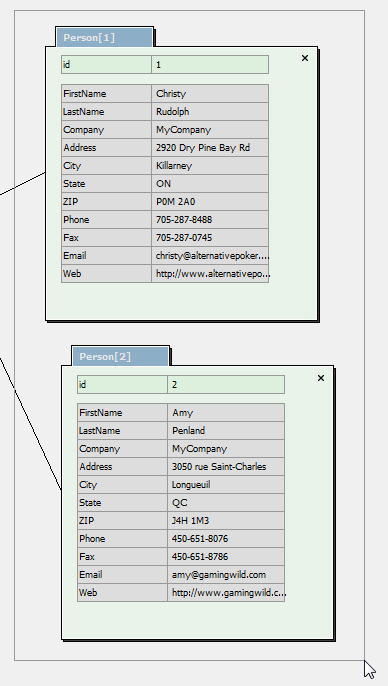 With the move function you change the order of child nodes of a (parent) node. Do do this, select the node and click the appropriate icon. For easier handling move operations can also be executed using the mouse wheel. Select the node and hold down the ALT key. Moving the mouse wheel will move the node up/down. 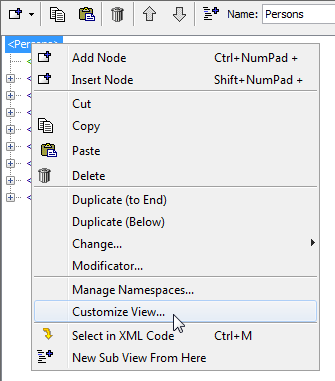 With the Easy XML Editor you can show nodes of a XML file in sub views. This helps to handle large, complex XML files. Changes applied to sub views are directly applied to all views. This will add a sub view. It is labeled with the name of the node and its position. The so called Modificator enables you to define a set of conditions. If these conditions are met for a node, several actions can be applied to these node. 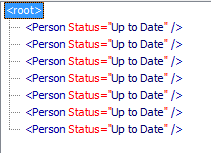 In this example a child "Status" is added to every node "Person" having an attribute "id". You can apply the operations to the current file (see window title) or all opened files. 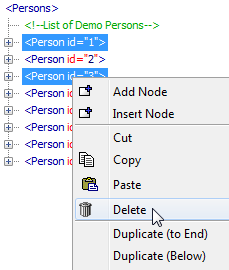 Is "Selection only" activated, only the selected nodes are considered. 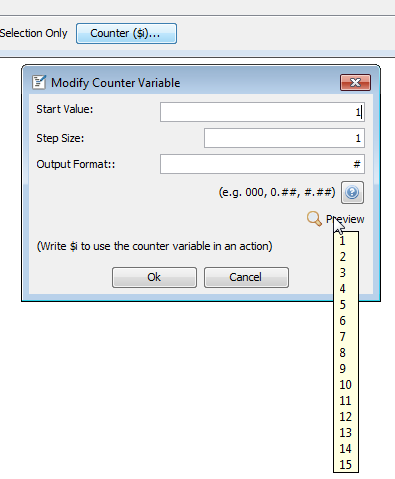 In this window the start value, step size and output format can be customized. With clicking the button with the question mark you can access a web site that describes the possibilities of the output formatting. In order to see which counter values will be generated, move the mouse over the 'Preview' text. Not all actions are available in the test version! As a matter of course in the full version they are. 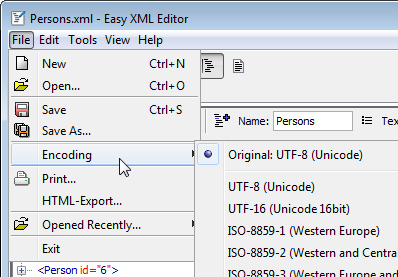 The Easy XML Editor offers a simplified way to add copies of existing nodes/attributes. 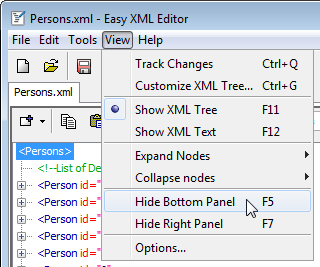 For the example file it may be a common task to add new "Person" nodes. We can fill it with the necessary child elements/attributes. 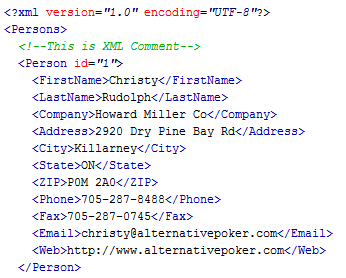 As an alternative to the XML tree editing you can also edit the XML code directly. 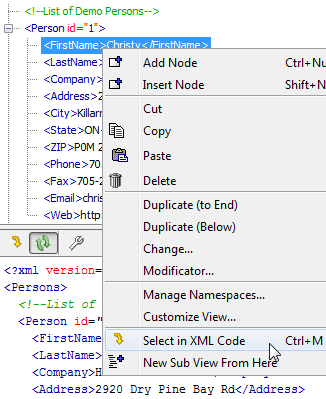 Changes applied to the XML code can be applied to the XML tree. 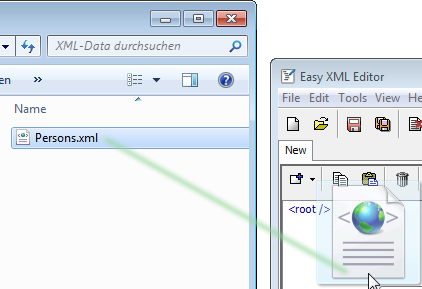 After opening a file you can access the XML code using the icon of the tool bar. 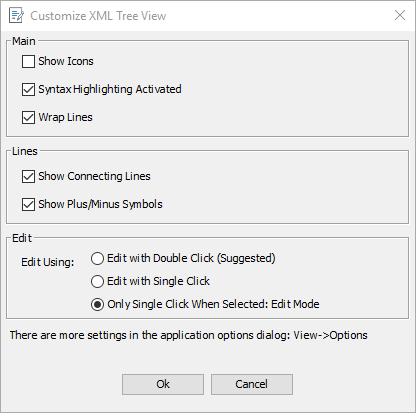 In order to synchronize the changes between XML code and XML tree, use the items in the context menu of the text editor. 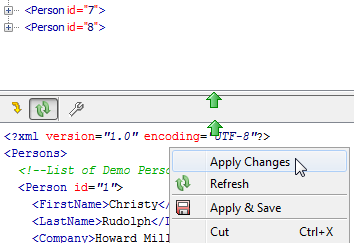 To apply changes of the XML code to the XML tree, please use the function "Apply Changes". 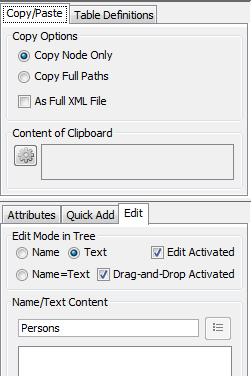 To apply the changes of the XML tree automatically, activate "Apply Changes of Tree Automatically". 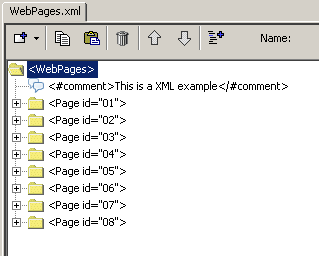 Please mind that for large files the recreation of the XML text may by remarkable computation effort. Because of this it may be reasonable to execute the recreation only manually for large files. 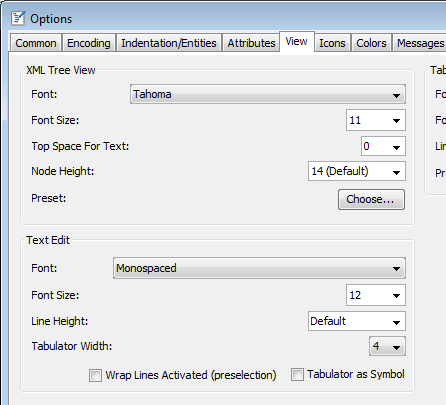 For better orientation you can select the text representation of a tree node in the text editor. For this, use the function "Select in XML Code". Switch to the tab 'View', there you can make the changes. Confirm with 'Ok', the changes are applied immediately. 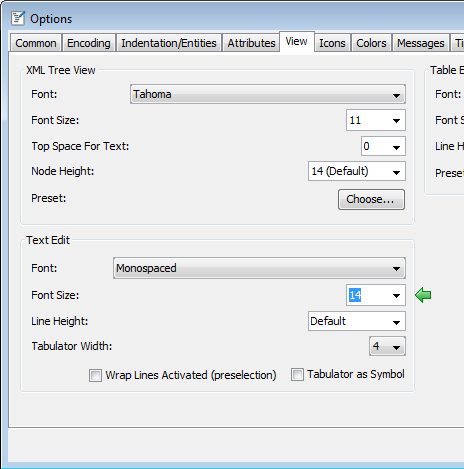 You can customize, how wide a tabulator indentation should be in the editor (in number of characters) and whether a special symbol should be shown for every tabulator. These options are located in View->Options (see screenshot of previous section). 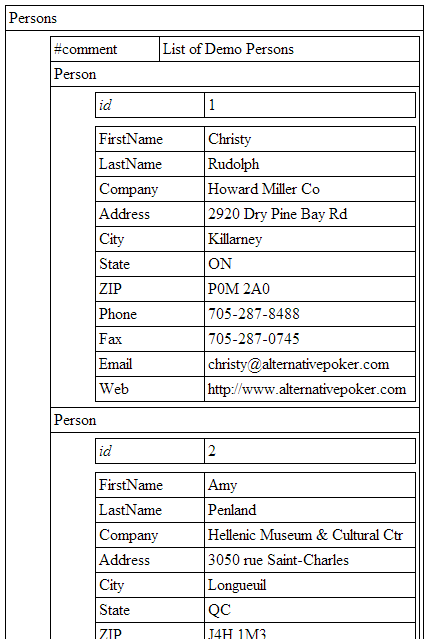 The following screenshot shows an example with tabulator signs shown. 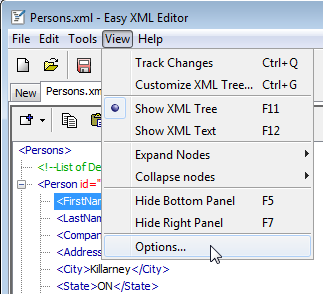 Here you can perform full text searches for nodes and attributes of the XML tree. The search results are listed. 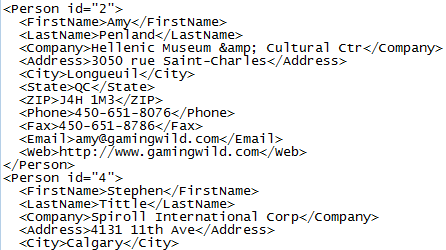 When clicking on one of the lines, the XML tree jumps to the search result. Full match: If activated, only hits that exactly match the input are listed. This means no additional text is before or after the text searched for. If deactivated, everything is found that contains the text entered. 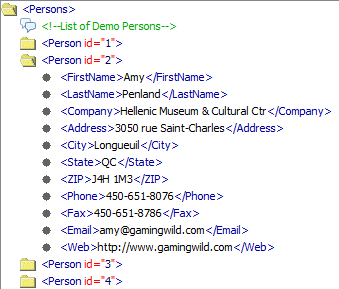 Find node types: If this is activated, the node types selected are found, regardless of their content. 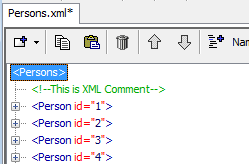 If for example you want to find all comments, select 'Comment' and 'Find node types'. 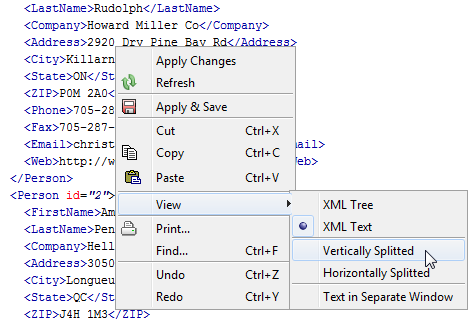 If you want, the Easy XML Editor can mark all changes applied to the XML tree. If the option is activated, the changes are marked using several ways. See next section for details. 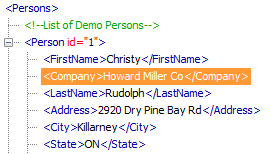 All modifications applied to the XML tree are listed in the tab 'Undo/History'. The tab is, by default, located at the bottom of the main window. Using the buttons 'Undo' and 'Redo' or CTRL+Z, CTRL+Y you can go one step further or one step back. With the menu item 'Clear History...' (also in context menu of undo list) you can remove the items in the change history. Doing this will no longer mark the changes, please mind that redo/undo will no longer be possible after doing this. 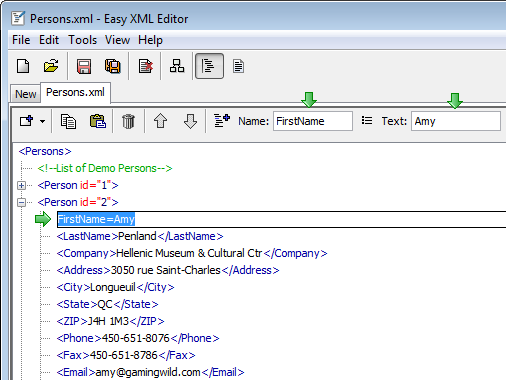 With the Easy XML Editor you can easily map XML data to tables. This offers the possibility to apply changes in a new and handy way. 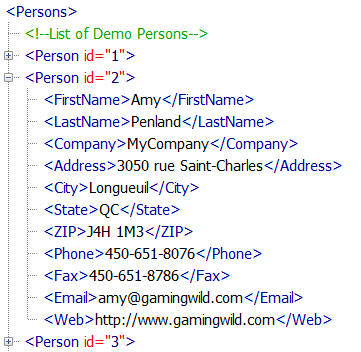 First it is needed to define, how XML nodes and attributes are mapped to tables. How to do this is described in the example that follows. 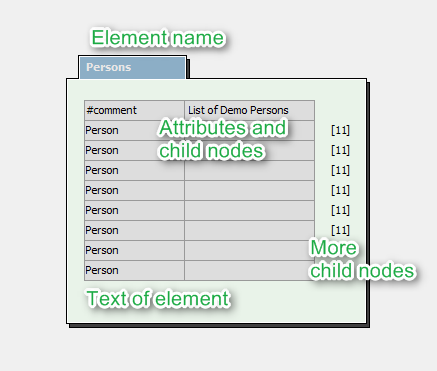 Please select the node whose children or child-children contains the attributes or elements to change. 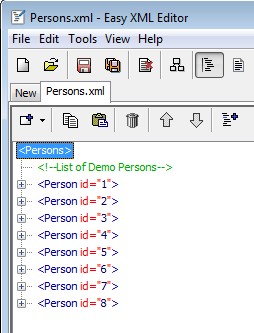 In our example this is the XML file root node 'Persons'. 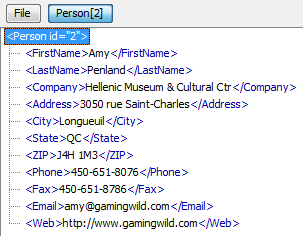 It contains multiple persons with their data. Please choose the tab 'Table Edit' located at the bottom of the main window (by default). 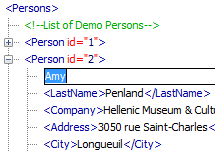 It is used to define the table definition, for more information see next step. 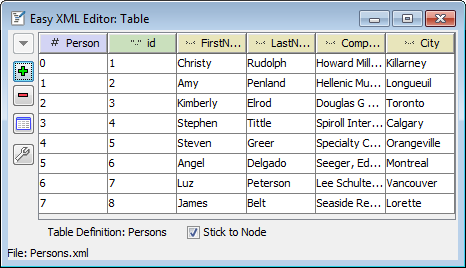 In this step you choose a node that acts as a reference node for the columns of the table. The children and attributes of this node specify, which columns the table would have. To proceed, please select one of the nodes of the first level and click "Choose as Reference Node". The node is used as reference node, it is marked in color. 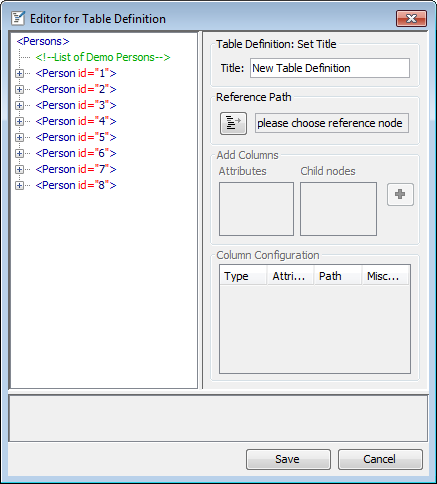 The list of columns defined and the preview table is updated. 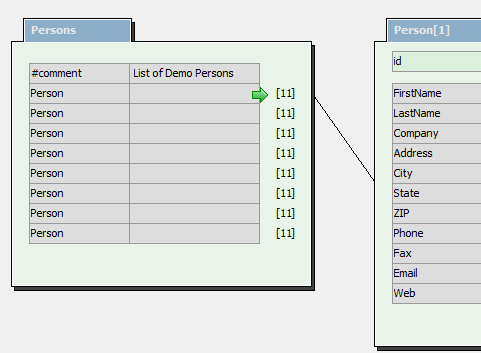 For editing the master data we want to omit some columns. The preview is updated, the columns are removed. 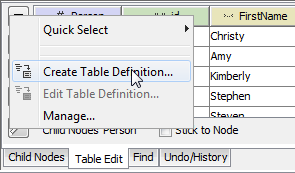 The table definition is configured as we want it. 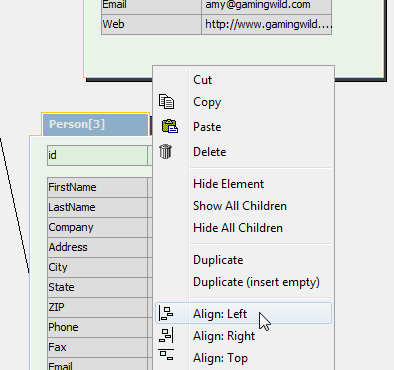 Using the context menu you can also reorder the columns or edit column details. 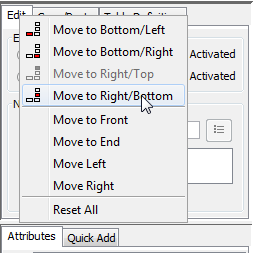 Reordering is done even faster when using the mouse wheel with pressed ALT key on selected entries. 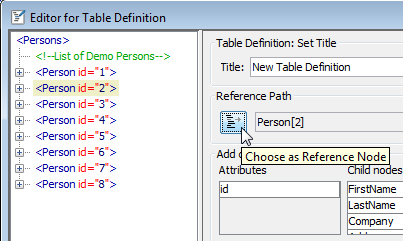 To finish the creation of the table definition, enter a title and confirm with 'Save'. 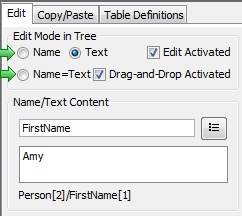 Along with saving the table definition it is chosen for the tree node selected. 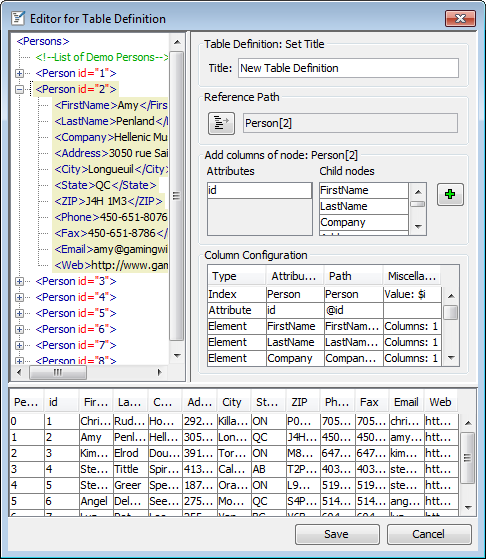 The table is populated and the name of the table definition is shown. Using a double click (by default) on a cell it can be edited. The modification is directly applied to the tree. Doing this will add an empty node to the tree. 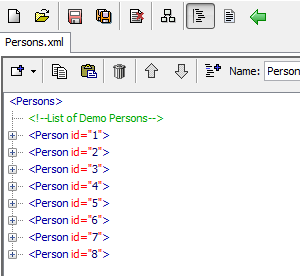 The gray fields in the table indicate that the attributes/elements (id, FirstName, ...) do not exist yet. You can also use the keys INS or CTRL++ to achieve this. 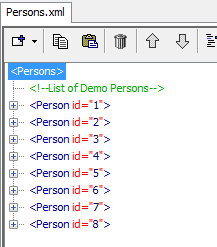 Using the button "Delete Selected Rows" you can delete the selected rows. 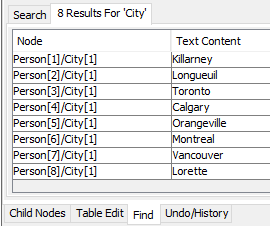 Typically the content of the table "Table Edit" is switched to the node selected. To prevent this, please activate the option "Stick to Node". 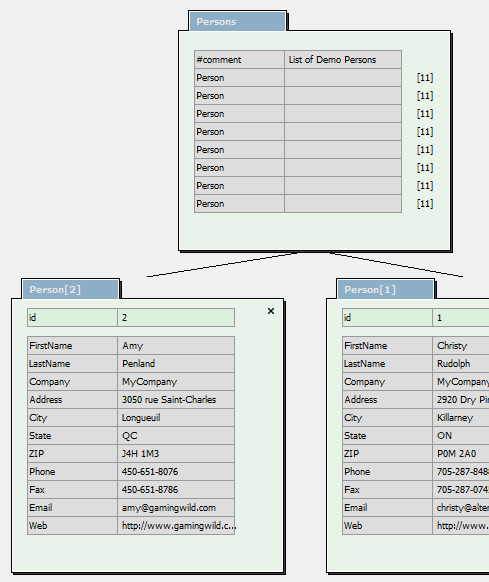 When working with the tree, the table will stay fixed to the node selected before. 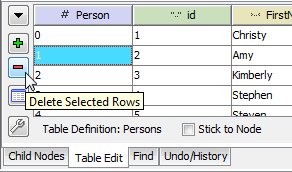 To edit data more easily you can show multiple tables in own windows. Use the option "Stick to Node" as described in the previous bullet point. 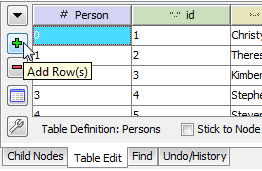 You can sort the tables by single columns. 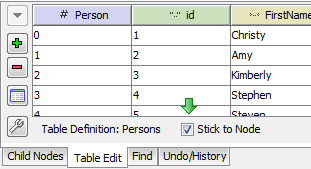 Clicking once or twice on a table column will sort ascending/descending. The asterisk indicates sorting for this column. 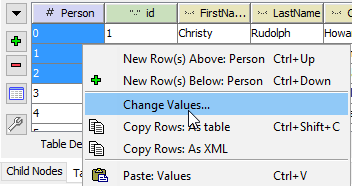 Using the function "Change Values" you can change the data of multiple rows easily. For this, select the rows to edit, holding down SHIFT or CTRL may help. 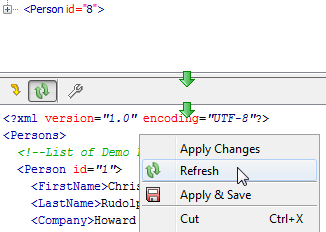 When all rows are selected, right click into the table and choose "Change Values" from the context menu. The window "Set Values" will appear. By activating the checkbox "change" you declare that the value should be changed. 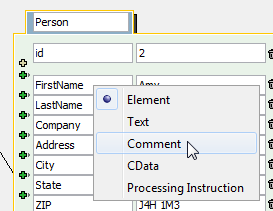 If so, enter the new value into the text field. 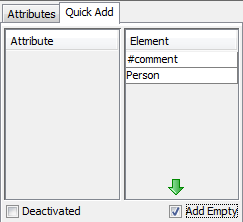 Activating "delete" will delete the corresponding attributes/elements (including children!). By confirming with "Ok" the changes are applied. 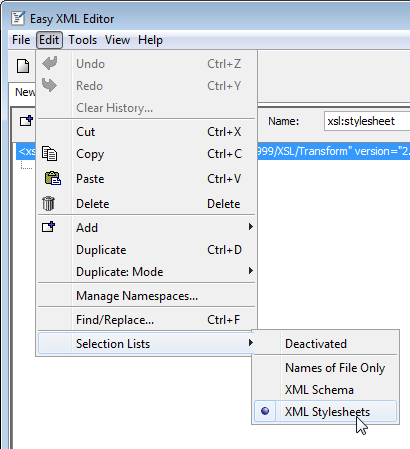 You can export the data as shown by table edits to the clipboard or a file. 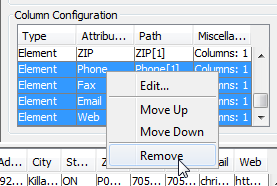 To do this, click the button "Options" and in the context menu "Export". Add headings: If activated, a heading row is added to the top. 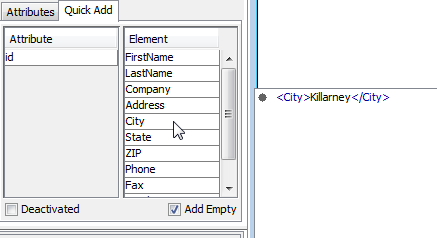 By clicking on the button "Export" the data is exported according to the properties set. 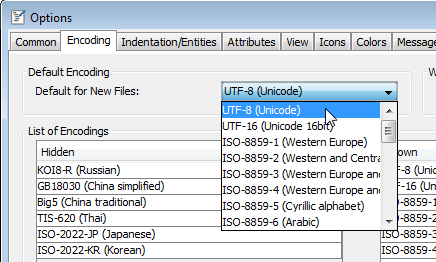 Customize lists: The list of encodings can be customized, for details see next section. 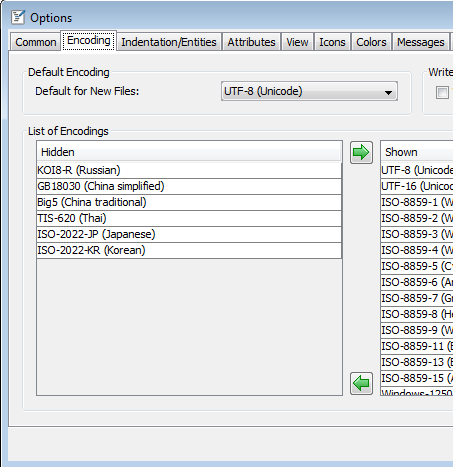 Switch to the tab "Encoding"
Here you can specify the shown/not shown encodings. 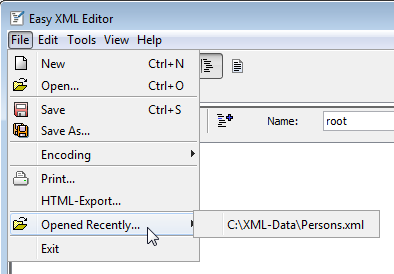 Easy XML Editor allows you to edit XML files as graphs. 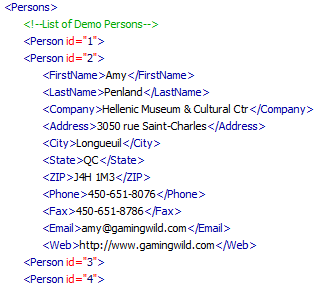 For the several elements rectangles are shown that can be arranged to visualize the XML data. The term "box" is used to indicate those rectangles in this help text. To zoom in and out, you can use the combo box in the top right or the mouse wheel when the CTRL key is pressed. 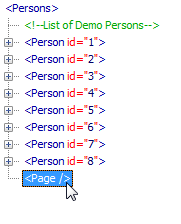 To show a sub element, click on the number in the row of the parent element. This number indicates the count of children of the child. For closing element boxes, click on the ‘x’ in the right top corner. As an alternative sub elements can be shown/hidden by right clicking an empty area of the box. 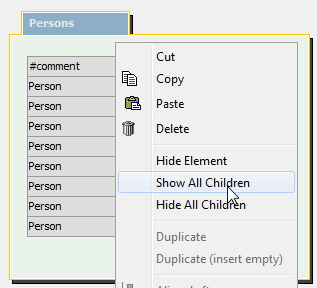 The context menu will open, select ‘Show all children’ or ‘Hide all children’. 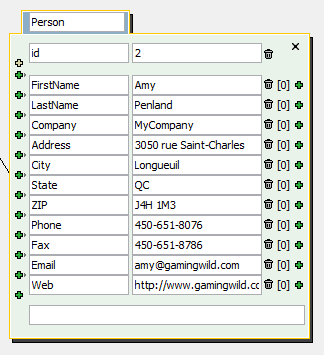 To select boxes click on a single box or draw a box around with left mouse button hold down. Selected boxes are colored. By holding down the SHIFT key you can add boxes to the selection by clicking on them. The data of elements shown can be added directly in the graph. 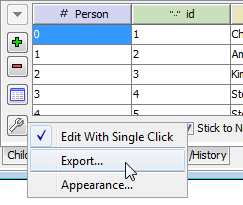 To do this select a single box and edit the text in the fields. The Plus signs on the left are to add or insert attributes or children. The Plus sign on the right are for adding child elements to the corresponding row. 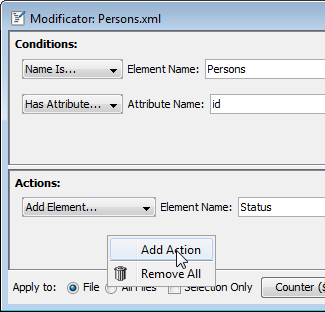 Click on the trash icons to delete attributes or children. 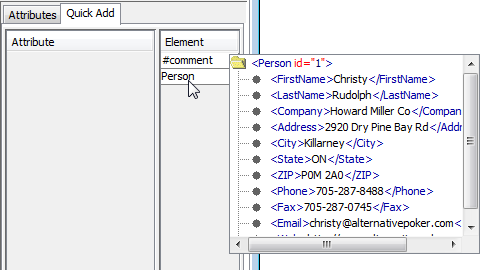 The node type is changes using the context menu of the name field. 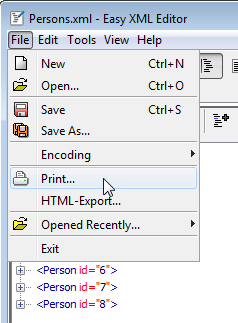 The functions to align and distribute are accessed using the context menu or the icons on the left of the window. The boxes are selected. 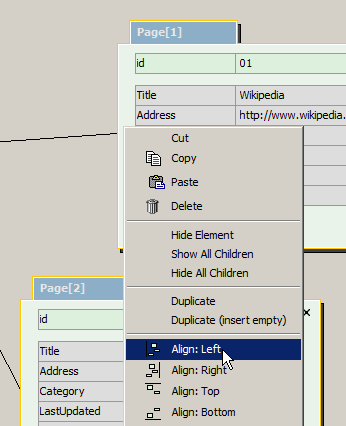 Selecting "Align: left" in the context menu will make them positioned in line. To save the layout click on the button "Save" . The current box adjustment is saved to the layout. 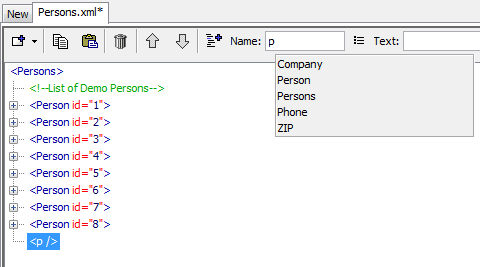 To load a layout, select an entry from the list. In a layout it is saved which children of which element are positioned where. 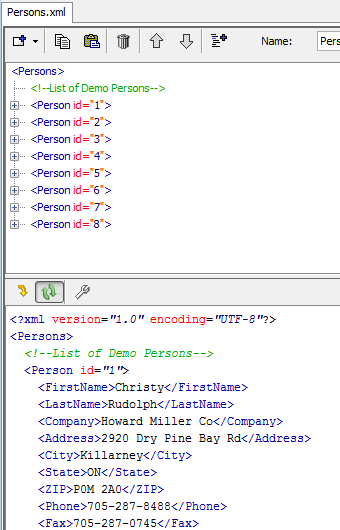 Because of this it is also possible to apply a layout to other XML files than the one it has been created with. For the graph view there are multiple designs available. Which design to use is selected with the list in the top right corner. 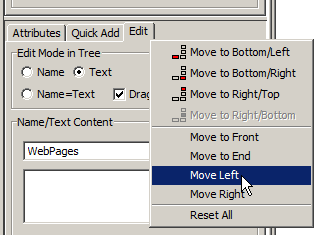 To move the tab next to "Attributes", select "move left" from the context menu. 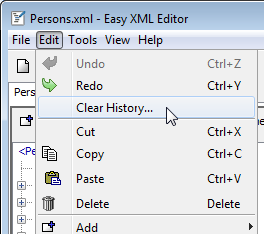 Please note: When closing Easy XML Editor the properties of the last opened file are saved and applied to every new and opened file. The panels in the window can be hidden if needed. This gives more space for the remaining parts. Instead of using the keys or the menu items you can also drag the divider at the border of the window into the window. This will open the panel. With the buttons "Choose..." typical combinations of these operations are accessed (see below). 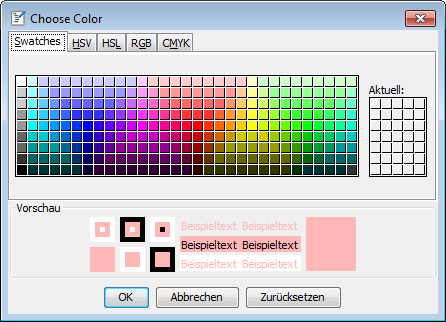 With the button "Choose preset..." typical presets can be accessed for the first three icons. 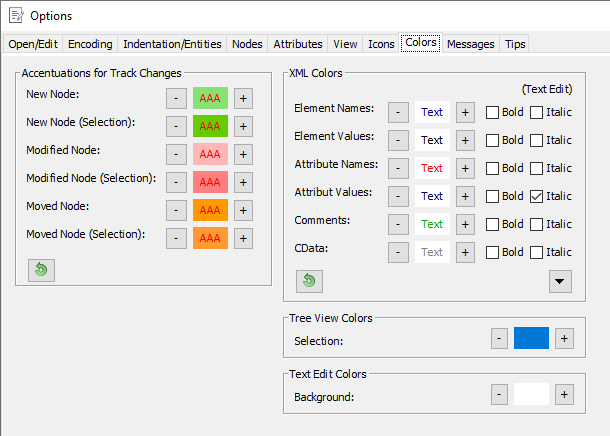 You can change the colors used in the tree and the text edit as you want. The buttons Minus/Plus are quick helpers to adjust the colors. Indentation: How are levels separated? 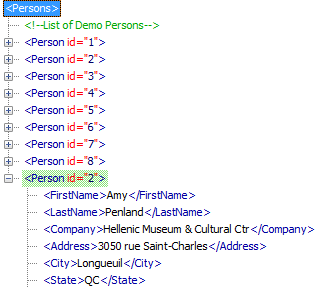 Entities: which entities are stored as characters or in the form &#nnnn;? 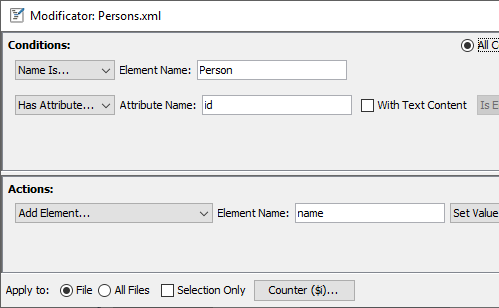 For the indentation you specify, which characters are used to indent (spaces, tabulators) and the number of characters for each level. 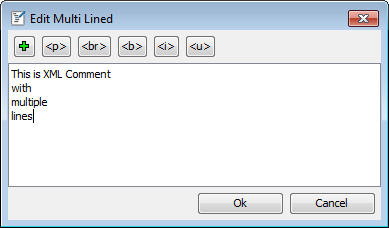 Under certain circumstances it may be wished to not use any line breaks, if this is necessary, please deactivate the option 'Wrap lines'. 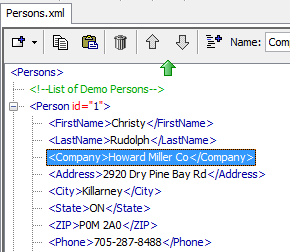 When saving XML, special characters (called entities) can be saved either as character (e.g. €, &) or encoded in text (e.g. &#8364; for the euro symbol). How the special characters are written to elements or attributes, is defined in this page (see above). You can print the tree view or the text. 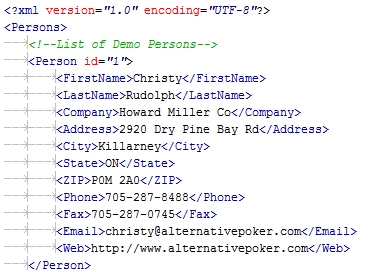 The content of the file loaded can be exported to a HTML file. With it you can e.g. send the contents in a readable form. 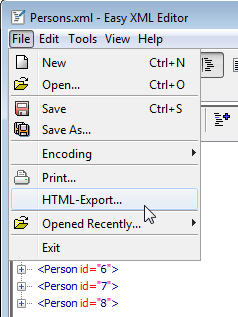 To do this, choose the menu item File->HTML-Export. On the top right of the main window tips are shown for some options you have used. Tips typically suggest a shortcut or something similar. To hide the tip area please click on the bulb. In this chapter hints are summarized that even experienced users may not have seen. 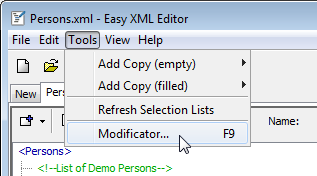 Open via drag-and-drop: You can open files by dragging them from the Windows Explorer© into the Easy XML Editor window. Details on this can be found in Chapter 1.2 . 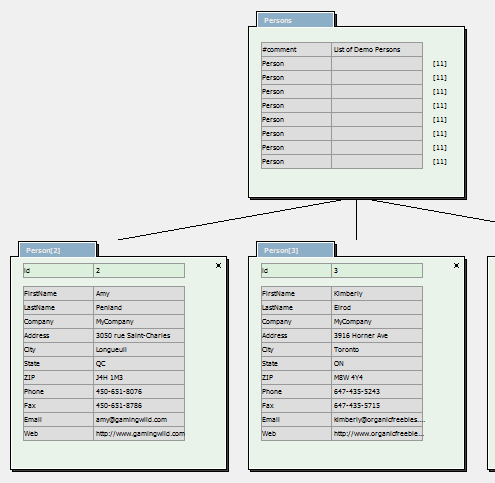 Quickly add element nodes or attributes: Use the key 'a' or 'e' when nodes of the tree are selected to add attributes or elements using a dialog. Details on this can be found in Chapter 2.7 . 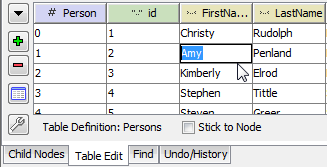 In list of configured columns of the table definition editor: Mouse wheel with ALT key pressed will move the selected column up/down.